Imam Alhagie Jallow was born in Mbollet, Gambia in 1987. After completing his primary studies, he traveled to Diourbel, Senegal where he completed the memorization of the Qur’an. 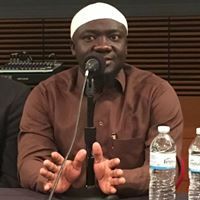 Upon returning to Gambia, he taught Qur’an in Masjid Bilal while completing his secondary education until receiving a scholarship to study at the Islamic University of Imam Muhammad bin Saud in Riyadh, Saudi Arabia. During his seven years of study in Riyadh, Alhagie graduated with a degree in Shari’ah and learned from some of the foremost Islamic scholars of our age including Sheikh Sadhan, Sheikh Abdullah ibn Jibreen, and Sheikh Saalih ibn Fawzaan al Fawzaan. Alhagie became the Imam of the Masjid Us-Sunnah shortly after his visit to Madison in 2009. More than just leading prayers, he also conducts lectures, organizes Islamic education classes for children, and meets with non-Muslims to help grow an understanding of the Islamic religion. Focusing his lectures mainly on authentic Hadeeth and the Qur’an, he spends time explaining the different schools of teachings in regards to any subject.